The Acer Iconia Tab A200 is one of the first 10.1-inch tablets to come pre-loaded with Android Ice Cream Sandwich, Google's latest mobile operating system. It costs less than £300, is available in an attractive red finish and packs a 1Ghz Nvidia Tegra 2 chip. Acer is pitching the A200 at the first-time-tablet buyer, those who are completely new to the experience. That's clear enough from the somewhat cheesy promotional video that came on our review model, showing a family gathered around a campfire roasting marshmallows and gazing at the tablet. The design of the AT200 is designed with accessibility in mind. The corners are gentle curves and the back of the tablet has a soft rubberised coating – similar to the BlackBerry PlayBook – that is easy to grip and won't get covered in smudges and scratches. The design is available in Titanium Grey and Metallic Red, with the Red looking much nicer. Unfortunately though, while the chunky design in attractive, it's also rather hefty at 715g. When compared to the 601g iPad, you can feel the extra weight after holding it for a while, especially if you're holding it in one hand. It's also quite thick at 12.4mm. There's no doubt this is being touted as a media machine and the screen is suitably glossy. There's a 1280 x 800 pixel resolution so you'll have no trouble enjoying the latest Hollywood release at 1080p high definition. There's a 17mm bezel around the 10.1-inch screen, which doesn't interrupt viewing although we did find that the brightness doesn't go as high as non-Android tablets like the PlayBook or new iPad. And our one concern, as ever, is that the screen will quickly attract all the usual dust and smudges that adourn our touchscreen gadgets. The adoption of Ice Cream Sandwich has been a slow one and it's a real benefit that the A200 has it on board from the get-go. For the most part, the new OS is just an exercise in making things slicker and faster than before, although there are a few cosmetic changes including a revamped font and horizontal swiping rather than vertical. You can also now drop several apps into folders, like on iOS. Instead of the old pull-down notification bar, you now have all your information displayed in the bottom-right of the screen. A quick tap on the clock will bring up notifications and settings. You're still given five homescreens that you can populate with apps and games from the Google Play marketplace. Google Play has been gaining ground of late and you can now access over 450,000 apps (some are free, some cost money) to use on the AT200. For the most part, Acer has kept Ice Cream Sandwich as Google intended – avoiding extra skins or layers that might clutter the experience. 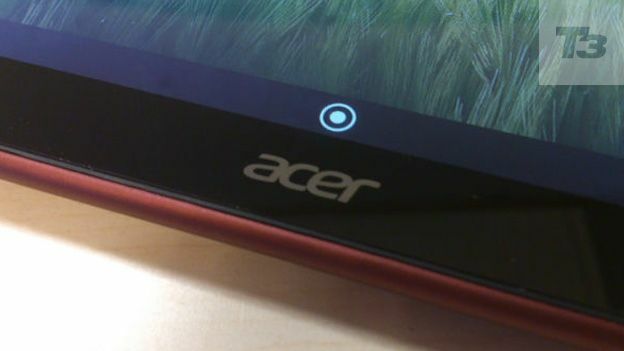 However it has added the “Acer Ring” – a small yellow circle in the centre of the navigation bar. Tap it and the screen is filled with a ring graphic that gives you quick access to four shortcuts, a web search tool and scrollable volume control. You can customise the shortcuts in the settings menu and the ring can be loaded up at any time. It's not exactly a stand-out feature, but we did find it became useful as we began to use the tablet. Under the hood, the Nvidia Tegra 2 processor does a good job of keeping things smooth although it won't be as flawless as the higher range Tegra 3 chips now being loaded into Android tablets. That's to be expected though as the Acer Iconia A200 is the budget option of Acer's 2012 line-up that also includes the A510 and premium Acer A700. The dual-core chip runs at 1GHz and you'll find plenty of power for enjoying games or playing music and browsing the web. The Acer surprised us with an impressive battery life that we admittedly weren't expecting. We ran a looped 1080p video across the Wi-fi connection with Bluetooth switched on and brightness turned to maximum. Even so, the Acer managed to last for 350 minutes before giving out. We reckon that a shade under 6 hours is not to be sniffed at and, with careful management we'd expect to squeeze another hour or two out of this tablet. We do feel that Acer has quite an impressive budget tablet on its hands here. The Taiwanese company usually scores highly for its laptops - managing to pack in impressive power and still keep the cost down. The same is true here. Getting a 10.1-inch Tegra 2 tablet with ICS for less than £300 is a good deal in our book. The friendly design and MicroSD storage are both positives and while there are cutbacks (it lacks a rear-facing camera) they shouldn't unduly concern you if all you want is a budget media tablet for the family to use.